This article feature comparative advantages between FingerTec fingerprint system, the comparative advantages between FingerTec, FingerTec System Advantages and FingerTec application scenarios. Huge user database is made possible via FingerTec FRIS II Not possible due to system design limitation and no connectivity. DiGiPAY (RRP: RM699) payroll software can be linked to FingerTec for comprehensive payroll.Available for Malaysia market only for the moment. Every package of FingerTec comes with self-guided manuals and videos for easy operation. System Development Kit (SDK) is available for free to all FingerTec resellers who want to do integration. Complete network communication interface is available including on-board TCP/IP, RS232, RS485, USB (select models). FingerTec display is available in multiple languages and software is offered in various languages to suit to different customers around the world. New language inclusion can be done upon requests. Fingerprint recognition is fast and accurate with standard optical sensor and UPEK sensor as an option. FingerTec offers multiple verifications which include fingerprint, card and password in one system to offer convenience and choice to clients. FingerTec fingerprint and card models offer RFID card as standard and HID and MIFARE as optional made-to-order. 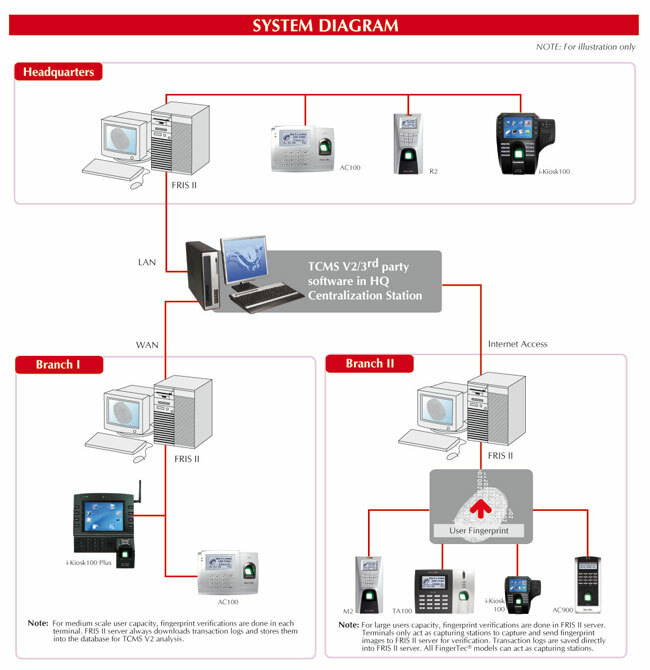 All types of readers and card systems can be linked to one system for effective management. FingerTec card readers TimeLine and Kadex come with on-board TCP/IP, USB and display panel, which are rare in other similar card readers available in the market. FingerTec offers TCMS V2 software in its standard package without any additional cost. TCMS V2 is comprehensive software that covers time attendance requirements as well as door access control with 22 printable reports available. FingerTec offers central multi-models, multi-terminals management over TCP/IP with TCMS V2 latest version, which accepts 255 terminals at any one time. TCMS V2 has straightforward system backup mechanism for ease of use and peace of mind. Attendance data from FingerTec terminals can be exported based on user self-definable table format to MS Excel, ASCII and ODBC for 3rd party system. Free upgrade of FingerTec TCMS V2 can be obtained online at Technical Tips and User Microsite without any additional cost. Comprehensive data is prepared and published online through FingerTec eight support websites for easy support. Which system is required? Fingerprint only, Card only or combination. The purpose of the system? Time Attendance only, Door Access Only or combination. How many units they plan to install? Do they have any existing system? What is the budget? The budget determines the model being suggested. If no access control required and fingerprint is a preferred time attendance system, recommend TA102. If no access control required and fingerprint & card is a preferred time attendance system, recommend TA103-R. 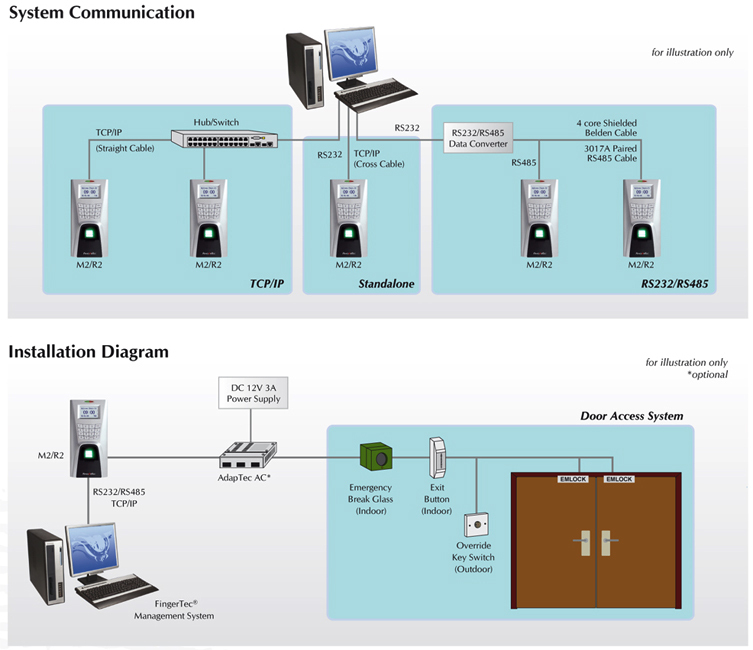 If no access control required but the client prefers to have a card system only, recommend TimeLine 100. If access control is requested and client wants fingerprint and card with USB, R2 is recommended. If access control is requested and the client wants fingerprint system but is concerned about budget, recommend AC900 but please explain that AC900 does not have any USB port and it does not read any card. If access control is requested and the client does not have restriction on the budget but wants state-of-the-art product, i-kiosk 100 Plus or i-Kiosk 100 or Q2i is the better suggestion. If access control is requested and the client wants card system, recommend Kadex. Companies with branch offices and requires centralized time attendance and individual access control management. As corporate is looking for centralized staff attendance system which supports not only local office but also branches and regional office through private/open network, each office requires at least one FingerTec terminal installed with TCP/IP connection. FingerTec reader with USB port is recommended as backup option during connection problem period. To ensure effective enrollment and commissioning of the system, the headquarters is responsible to allocate a range of user IDs for the branch office employees, set up of duty roaster and enrollment of fingerprint, if required. All the data must be available prior to any installation and enrollment for smooth operation. During daily operation, the headquarters using automatic preset daily schedule can download every branch attendance data or they can export data manually from the branch office. When the data has been collected, the headquarters has the entire staff’s attendance data for analysis. For a requirement that requires user database of more than the reader could offer, FRIS II is the application to be considered. Human Resource department can centralize the account setup and fingerprint registration in the headquarters by using PC-based FingerTec OFIS TA.